﻿ Cristiano Ronaldo: "I could return to Manchester United in the future"
07.09.2011 » Cristiano Ronaldo: "I could return to Manchester United in the future"
It's not exactly the first time that Cristiano Ronaldo hints at a possible return to Manchester United and English football, but this time, CR7 speech had a few other interesting notes regarding his old club, confessing he misses the times when he played with a Manchester United jersey. Cristiano Ronaldo granted a short interview to Sky Sports today and the Portuguese player confessed he misses the times when he played in England. More important than that, Cristiano Ronaldo admits he doesn't want to close the door to a possible coming back transfer and return to Manchester United in the future. However, CR7 insisted on noting that he is truly happy in Real Madrid at this stage of his career and he doesn't plan to leave in a near future. In a direct question regarding if he would consider moving back to England and Manchester United, Cristiano Ronaldo didn't rule out that chance: "I don't close that door, so maybe in the future I hope it can happen, because I know the league, the players and the atmosphere." 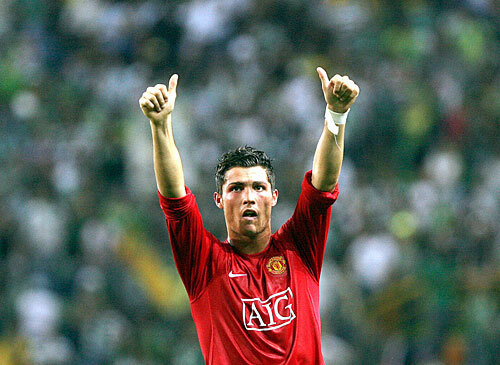 Ronaldo still holds Manchester United in a special place on his heart and if a potential return to the English Premier League happens, then it would very likely be on a Red Devils jersey: "I hope so one day, but we never know. The team that I like the most in England is Manchester United, but I can't say that I am going to play there one day, because right now, I am very, very happy in Madrid." A few months ago, Ronaldo assumed that he would accepting signing a 10 year contract extension with Real Madrid. However, Cristiano Ronaldo prefers not to promise anything right now and leave his faith for God to decide: "I've said a few times in the past, that if Real Madrid want, I can sign a contract for ten years more, until the end of my career, but nobody knows the future. I can't lie to all of you and say that I will stay in Madrid for ten more years and that I am not going to return back to Manchester United some day. It wouldn't be fair on my part. Let's see what future God has prepared for me." One very interesting remark on this Ronaldo interview made to Sky Sports, was the fact that Cristiano Ronaldo admitted that he misses playing for Manchester United and he feels nostalgic when he watches his old club on TV: "I have good memories from Manchester United and when I watch sometimes the games, I miss it a lot, because it's part of me I left in England. However, just because I play in Real Madrid, I'm not going to miss speaking with some of the old guys, so when I have an opportunity, I catch up and talk with Sir Alex Ferguson." Ronaldo then admitted how important Sir Alex Ferguson was for his career development and growing up, referring to him as a second dad. Cristiano Ronaldo: "I'm really happy with what I did in Manchester United and I don't forget the six years that I passed there. I have a lot of friends there. Sir Alex Ferguson is like a second father to me, because he helped me a lot to improve and now, Mr. José Mourinho does the same. They are both very experienced managers who win many things, so in my opinion they are the best coaches in the World. Sir Alex Ferguson was important for me when I played there, when my life was there, so it's always good to speak with him, because I'll never forget who really helped me." Cristiano Ronaldo recently said the Real Madrid is the best club in the World, but he believes that Manchester United deserves to be ranked as one of the best clubs in the World as well: "I said a few times that playing in Real Madrid was my dream, but playing for Manchester United was too. In my opinion, Real Madrid and Manchester United are the best clubs in the World and that's true maybe even considering clubs such as Barcelona, Chelsea, Arsenal or AC Milan. 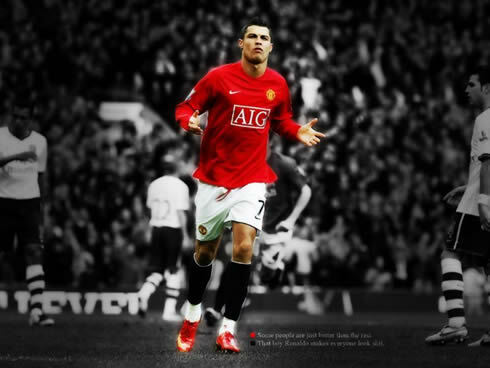 When Cristiano Ronaldo left Manchester United for Real Madrid, in the 11th of June of 2009, for a World record transfer fee of 80 million pounds, many Red Devils fans got heart broken and couldn't realize the reasons behind that decision. Cristiano Ronaldo noted, that as a football player, he needs to set new targets to keep challenging himself. Cristiano Ronaldo: "In life, there is a beginning and an end to everything. What I did in Manchester United was completely finished, because I won almost everything there. I always try for a new challenge and to move from Manchester to Madrid was not about a better contract or winning more money, but rather about a new challenge, being closer to my family, different weather and the language." But the main reason why Cristiano Ronaldo will remain one the best football players in the World was outlined after: "The most important reason why I moved was the challenge, because I really like to put myself under pressure to see what I can do. But I really miss the English Premier League. The EPL and La Liga are the best football leagues in the World." Real Madrid upcoming match in La Liga, will take place this Saturday, 10th of September, against Getafe. You can watch Real Madrid vs Getafe live streams inside our Live Games Streams section. Cristiano Ronaldo will certainly be on the line-up in this game between Real Madrid vs Getafe, to be played in the Santiago Bernabéu. The countdown clock timer, displaying the time left for the next Ronaldo game, is shown on the top right corner of all pages.